New Product: SafeGuard ISOmod |Micro-Trak Systems, Inc. The SafeGuard ISOmod uses an existing virtual terminal in the cab to control settings and display liquid blockage information. The SafeGuard ISOmod interface broadens command of the system by utilizing on-screen messages and simple icon buttons on the virtual terminal to access monitoring functions. View real-time status of individual and total sensors arranged into dual networks and independent left and right sensor banks. 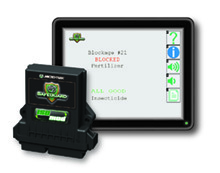 SafeGuard ISOmod brings state-of-the-art blockage monitoring to your virtual terminal system. Safeguard™ – Simple, Powerful, Trusted Protection.